We’d love your help. 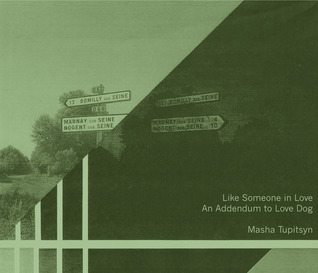 Let us know what’s wrong with this preview of Like Someone In Love by Masha Tupitsyn. To ask other readers questions about Like Someone In Love, please sign up. MASHA TUPITSYN is a writer, critic, and multi-media artist. She is the author of Like Someone In Love: An Addendum to Love Dog (Penny-Ante Editions, 2013), Love Dog (Penny-Ante Editions, 2013), LACONIA: 1,200 Tweets on Film (ZerO Books, 2011), Beauty Talk & Monsters, a collection of film-based stories (Semiotext(e) Press, 2007), and co-editor of the anthology Life As We Show It: Writing on Fil MASHA TUPITSYN is a writer, critic, and multi-media artist. She is the author of Like Someone In Love: An Addendum to Love Dog (Penny-Ante Editions, 2013), Love Dog (Penny-Ante Editions, 2013), LACONIA: 1,200 Tweets on Film (ZerO Books, 2011), Beauty Talk & Monsters, a collection of film-based stories (Semiotext(e) Press, 2007), and co-editor of the anthology Life As We Show It: Writing on Film (City Lights, 2009). Her new books, Picture Cycle and It May Take Years, are forthcoming. In 2015, she completed the 24-hour film, Love Sounds, an audio-essay and history of love in English-speaking cinema, which concluded an immaterial trilogy. The film was accompanied by a catalogue, published in 2015 by Penny-Ante Editions, and has been exhibited and screened in the United States, Canada, Europe, and Australia. Tarot Diaries, 2016, is an audio essay, diary, and mixtape about fate and future in late capitalism. In 2017, she completed the first installment, the 1970s, of her ongoing essay-film, DECADES. The second installment, the 1980s, was completed in 2018. DECADES composes a history of cinematic sound and score for each 20th century decade. The next installment will be the 1990s. Her criticism has appeared in numerous anthologies and journals. She teaches film and literature at The New School.